The FL-1600A series has been discontinued. Please see the FL901G series as a possible alternative or contact our Flow Engineering department. 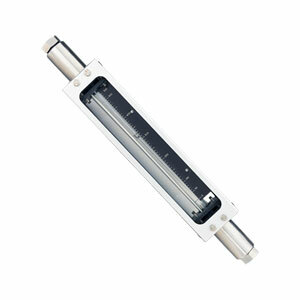 OMEGA™ FL-1600 industrial flowmeters are designed for high accuracy industrial uses. They feature dowel-pin, side plate construction and externally adjustable packing glands for use in industrial piping systems. End Fittings: 316 SS std. FL-1601A 0.22-2.22 0.055-0.55 3" 300 1/2"
FL-1602A 0.428-4.28 0.10-1.04 9" 300 1/2"
FL-1603A 0.796-7.96 0.19-1.90 6" 175 3/4"
FL-1604A 1.80-18.05 0.45-4.54 9" 100 3/4"
FL-1605A 2.5-25.76 0.63-6.28 13" 100 3/4"